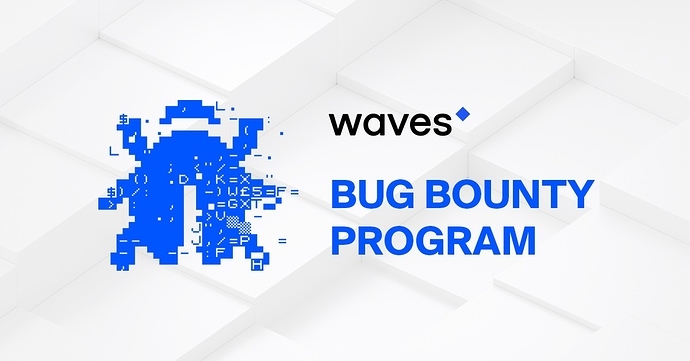 In order to provide the best quality of the product to the community, we are starting WAVES Bug Bounty Program. The scope of the Program: versions of the Node which currently deployed to official nodes on MainNet. We are interested in security issues, issues which can break the blockchain consensus, issues leading to inoperability of the Node. Issues that have already been submitted by another user or are already known to the WAVES team are not eligible for bounty rewards. Public disclosure of vulnerability makes it ineligible for a bounty. WAVES core development team, employees are not eligible for rewards. WAVES Bug Bounty Program considers a number of variables in determining rewards. Determinations of eligibility, score and all terms related to an award are at the sole and final discretion of the WAVES Bug Bounty Panel. The value of rewards paid out will vary depending on severity. The minimum payout is 10 WAVES and the maximum is 2000 WAVES for the most bugs. The highly critical bugs can be valued by the WAVES Bug Bounty Panel above the maximum. Reward sizes are guided by the rules below, but are in the end, determined at the sole discretion of the WAVES Bug Bounty Panel. Beyond monetary rewards, every bounty is also eligible for listing on our leaderboard with paid WAVES accumulating over the course of the Program. quality of reproducibility. Please include detailed instructions. quality of fix, if included. Higher rewards are paid for submissions with a clear description of how to fix the issue. Just send your bug report to [email protected]. The WAVES Bug Bounty Program is an experimental and discretionary rewards program for our active WAVES community to encourage and reward those who are helping to improve the platform. It is not a competition. You should know that we can cancel the Program at any time, and awards are at the sole discretion of WAVES Bug Bounty Panel. You are responsible for all taxes. All awards are subject to applicable law. Finally, your testing must not violate any law or compromise any data that is not yours. Hello, I found a bug, a token that was not released was released, will I be rewarded for finding this bug? Hi, we need more details. Please send it according to the Program rules above. Nice. Looks like you are interested in the platform security and it’s great! But what if someone will find a bug that can be sold to someone else for much bigger price then 1000 Waves or $3000? It turned out this was a very good question. The minimum payout is 10 WAVES and the maximum is 1000 WAVES. Good initiative but the incentive is far to low for this! Come on Waves team, you’ve got over 20k BTC available in your warchest but are to scroodgy to sepnd even 1 BTC for people who find essential bugs? This again proves my statement above. And it is good to know that “The highly critical bugs can be valued by the WAVES Bug Bounty Panel above the maximum.” Hopefully, the bonus would be reasonable. Thank you, Igor! Pretty good addition. This is not a bug, but the normal behavior of the application. Once a second, the test is performed and the line is deleted if it does not match the correct format. The correct format in this case is [“string_address”, “number”]. We understand that in your case this is not very convenient, but this functionality, first of all, is intended for sending to the addressees whose list is uploaded from the CSV file. Alternatively, you can edit your TXT file, add amounts in front of each recipient and paste it through the clipboard. Привет! Нашел несколько мелких недочетов DEX. Не работает функция свернуть биржевой стакан и количество монет отображается как Кол-Во. А хотелось бы что бы было Кол-во. Если вы про эту кнопку http://joxi.ru/5mdqj9JHkK4Np2, то это не “свернуть”, а “отцентровать” . Попробуйте проскроллить ордера вверх или низ и нажать, чтобы понять что она делает. Это тоже знаем, спасибо. В планах есть переработать стили. The reward for finding the bug is not assessed, as the support for the award said, why then promise?